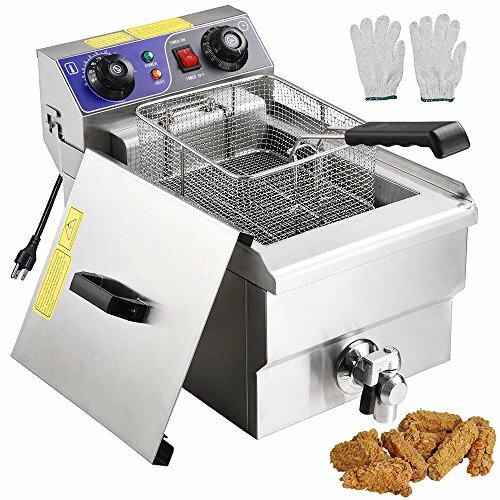 This 11.7L 1500W Single Tank Electric Deep Fryer features stainless steel construction, timer control and drainage faucet. It is designed for commercial uses, such as restaurants, supermarkets, fast food shops, snack bars, etc. -Temperature limiter for safety - it can cut off power automatically when the temperature controller breaks down and the working temperature is over. -Inching switch for protecting the machine - if the machine head is taken down when the fryer is working, the switch can cut off power automatically. Overall Dimensions: 18" x 11" x 13"
Handle Length: 9-1/2" Power Cord Length: 59"